I've been bitten by the nesting bug. Big time. 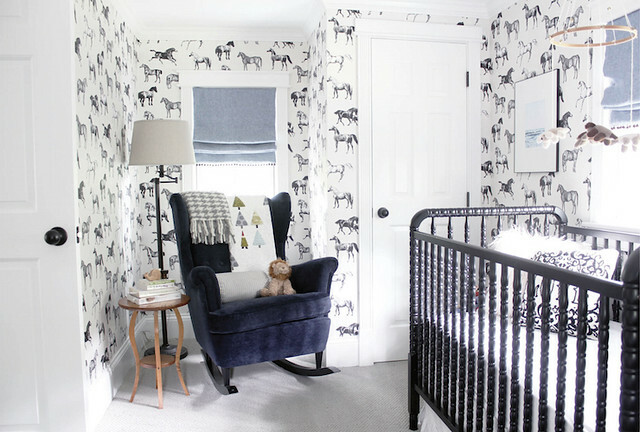 These past few weeks have seen me perusing the internet like a mad woman searching for inspiration for the boys' nursery (who am I kidding? I've had ideas and plans brewing in my head for years). The truth is I'm trying to focus my energy on my excitement vs. being scared shi//less about having two babies. And part of what gets me all kinds of excited is picking out decor for our little dudes. We're staying away from the whole themed/coordinating nursery and making their room, which is currently our dressing room, an extension of our bedroom. Since the two rooms are only separated by a door, the colours will remain in the same palette as our bedroom: grey, white, cream and aqua with perhaps a bit of black to ground the space along with some natural elements (wood and rattan). My goal is for the space to feel calm, fresh, modern and charming. 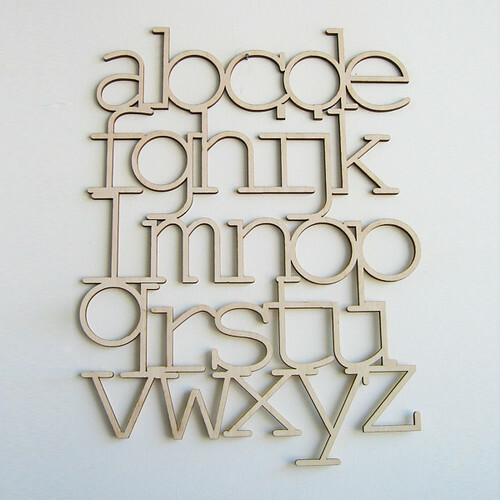 We recently purchased two white Jenny Lind-style cribs and the Bookhou laser cut birch alphabet. I've had my eye on both of these items since we first started trying to get pregnant. I can't tell you how good it feels to finally get them! Plus, I love the juxtaposition of the vintage crib paired with the modern font of the alphabet. 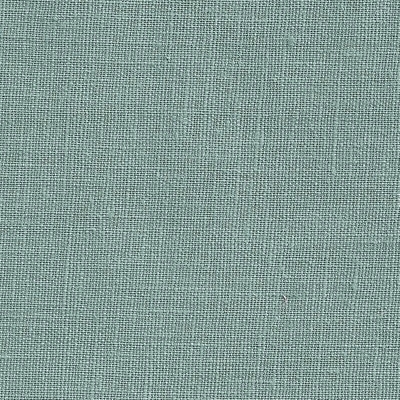 The swatch of aqua linen fabric is the colour of the existing roman blind in the room. We had it custom made with a black out lining by Tonic Living a year ago. It'll add a touch of colour to the mostly neutral space and keep the room dark enough for the babies to sleep for long periods of time (here's to hoping!). 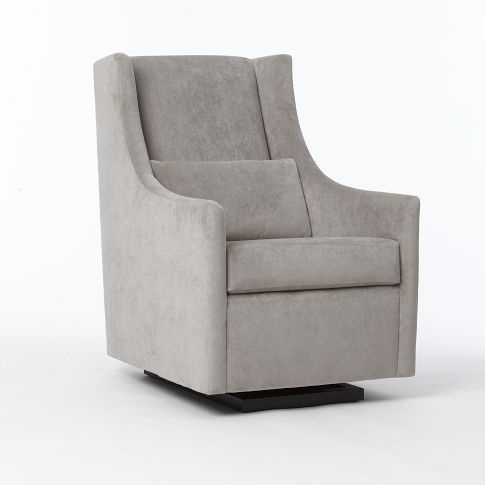 I spotted the contemporary yet classic Graham glider at West Elm a couple of months ago and tested it out this past weekend while in Calgary to see if it was a winner (read: comfortable & on budget!). It was both comfy and serendipitously on sale so we ordered it in this colour. If the glider hadn't worked out, we would've attempted this DIY rocking chair hack, which is both utterly genius and affordable. 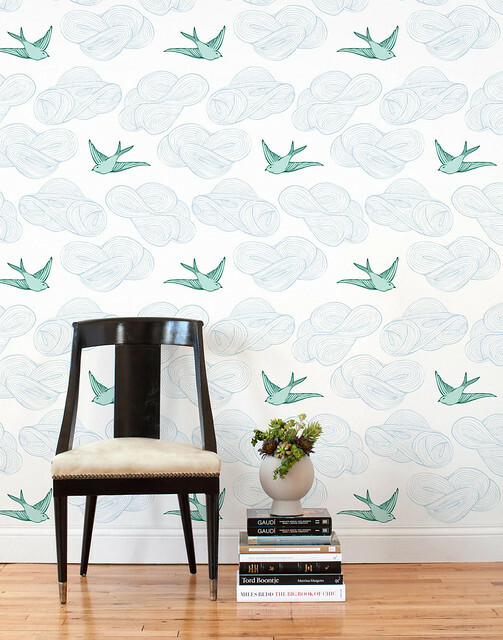 What I would most like to incorporate in the nursery is the Daydream fabric/wallpaper tiles designed by Julia Rothman for Hygge and West. 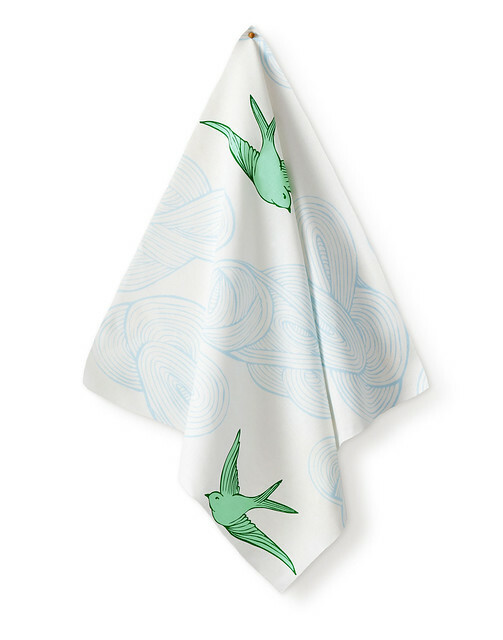 I've been enamoured with it for eons but am not sure if I want it on one of the walls or as a throw pillow or crib skirt (neither of which I know how to make). Then again it may be most economical to buy just a yard of the fabric and stretch it on a canvas like my pal Christine did in her lovely nursery with some cool Ikea fabric. Thoughts? 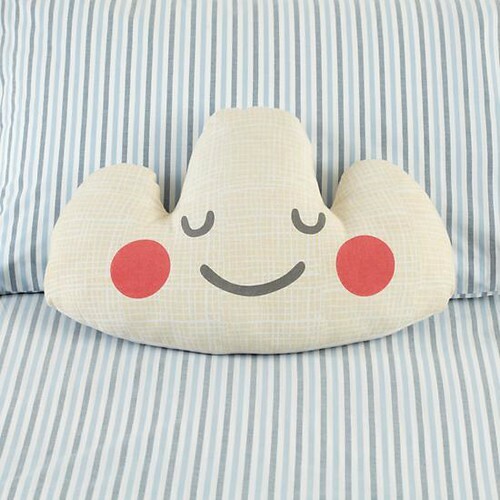 I'm digging this cloud pillow from Land of Nod and elephant basket from Zara Kids. This faux fur pom pom pillow also caught my eye as did these alphabet and pom pom bins. 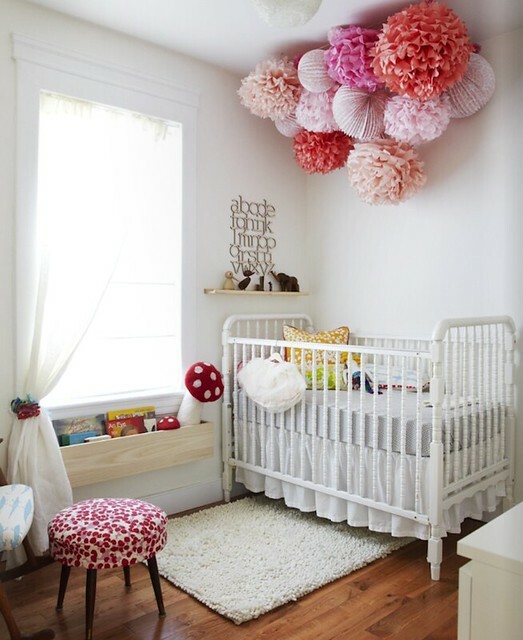 Every nursery needs a touch of whimsy, right? Here are some inspiration photos of nurseries which feature the Jenny Lind crib (can you spot the alphabet art in the room below?). 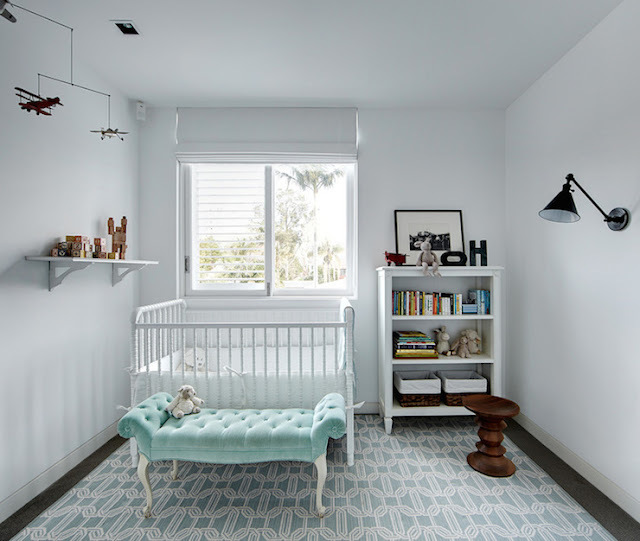 I also like this nursery inspiration roundup. 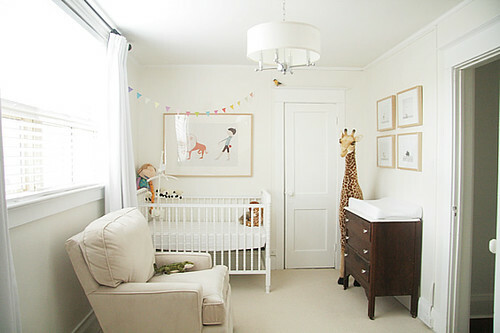 You'll probably be able to tell by these pictures that eclectic, modern, non-themed nurseries are my jam. Nursery sources: 1. // 2. // 3. // 4. // 5. // 6. This is truly the fun part! A whole new room to work on. Plus, I have a very tight deadline so procrastination isn't allowed... this time. I'm hoping my next nursery post will feature a before and after of a painted room, so stay tuned. P.S. 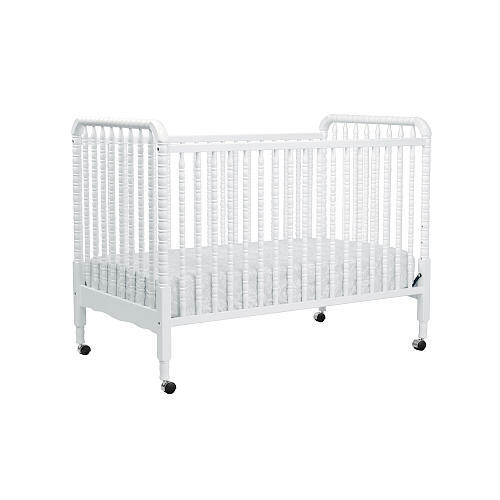 Any advice on what you feel is absolutely necessary to have in a nursery? Or what is essential gear for babies in general? I'm all ears (and frankly a tad overwhelmed by all the stuff that's available). Yay! Such exciting times! I love that crib (although I went with a different style because hubby wouldn't go for it lol) and I have a similar glider! My advice if you're thinking about getting a changing table is don't. It's a piece that won't grow with the boys, a dresser with a removable change pad will do the job just as well! You can store diapers/wipes/etc in baskets or in the drawers. Also, I found it so much easier to just change the baby on the floor and rarely even used our change pad. No rolling off worries, and with two, I would imagine doing things on the floor just makes sense! Also, I invested in a second hand diaper genie and I don't feel they are necessary at all - especially when the refills cost a bloody fortune! I never had a problem putting the diapers in the kitchen garbage and emptying that out everyday. Unless of course you are going cloth, then this comment is irrelevant ;) Can't wait to see some befores and afters! Thanks for all of the tips, Brie! We just bought an IKEA Hemnes dresser to act as a changing table, but I have a strong feeling the floor will become my best friend like it was for you. p.s. Nursery update should be coming up soon! The room is now painted. Yay! Looks so lovely! I am all for buying fabric as wallpaper seems so committed! 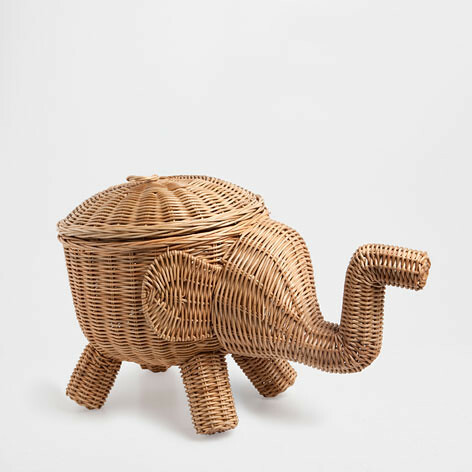 As for baby essentials - storage! Storage for baby linens, for clothes, diapers and all that jazz. I too ended up changing our babies on the floor because when they start to crawl, all you do is swing a leg on them to hold them down and then change those cute little bums. Ok, that sounds abusive---but I would just hold them down with my leg so they couldn't flip, that left my hands free to quickly change! ONE tip no one told me about little baby boys---have a cloth to cover their little baby part as they like to pee at random when that diaper comes off, and their aim stinks. Haha, love these suggestions and visuals B! And I agree, wallpaper is a commitment. I ended up ordering a yard of the Daydream fabric and it's beautiful. Think I made the right choice (can't wait to show you how it looks in the room!). Hi Dajana, I always love your taste in clothing and decoration. 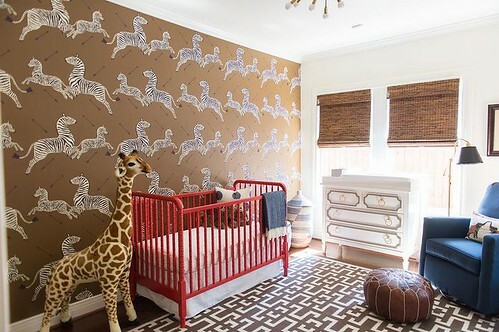 your nursery will definitely look beautiful. I also live in Edmonton and just found out I am pregnant after my 4th IUI. now I am looking for a good doctor to see him/her through my pregnancy. may I ask your doctors name? or do you have any suggestion? I'm seeing Dr. Chris Hoskins at the Hys Centre. He was recommended to me because he specializes in high risk pregnancies. as for the nursery items I would say a nice baby monitor, lots and lots of receiving blankets, a cold humidifier, nightlight. as for diaper genie I bought one when his poop started to smell real bad and honestly I didn't find that much difference between a simple bin and diaper genie. instead I put one solid air freshener in the bathroom and its good for few weeks. I'm loving the nursery plan, mama-to-be!! I can't sing enough praises for the Jenny Lind. You have a great grasp on the nursery essentials (blackout liner-YES! )....anything else can be bought as needed. Plus every baby is different so you'll find out what works for your two bambino bubs! Off the top of my head, a sound machine & video baby monitor are must-haves to this day for us. And yes to the Hygge & West Daydream stretched on canvas! 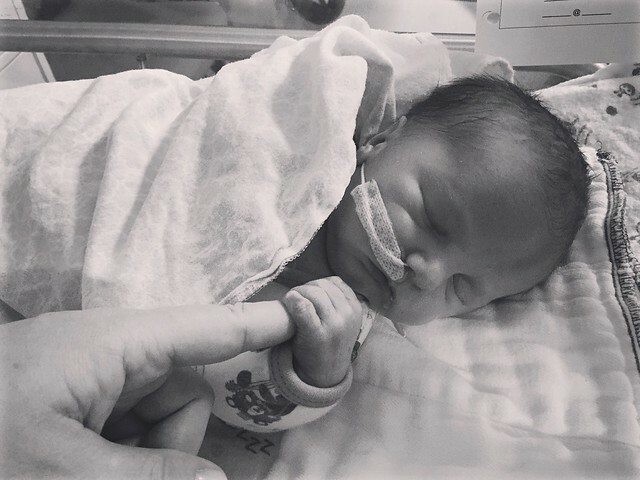 And I appreciate your advice -- seeing how much baby stuff is available can be so dang overwhelming for new parents. We stuck to getting the basics and will see what else we might need once they arrive. Eeek! Just a few more weeks! Wow, cool post. I’d like to like this too – taking time and real hard work to make a great article… but I put things off too much and never seem to get started. Thanks though.